LESSON 2: Have Your DNA and Eat It Too! LESSON 8: Stem Cells or Cloning - You are the Expert! SWBAT describe the basic structure of a DNA molecule and explain the rules of base pairing. It is important to take a closer look at DNA as a molecule. While students understand that living organisms are made up of cells, few students realize that DNA is a molecule found inside our cells. The basic structure of DNA is the same for all living organisms so this lesson gives students an opportunity to examine the structure by creating an edible model. My students have a difficult time with the vocabulary. We looked at chromosomes during mitosis. Our next stop is to take a closer look at the DNA stored in the chromosomes. 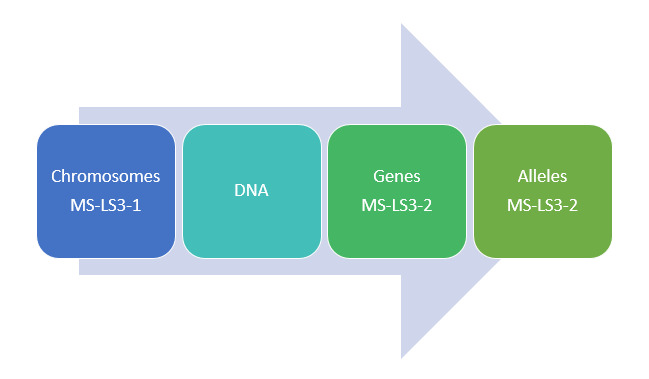 The Next Generation Science Standards (MS-LS3-1- Develop and use a model to describe why structural changes to genes (mutations) located on chromosomes may affect proteins and may result in harmful, beneficial, or neutral effects to the structure and function of the organism.) and (MS-LS3-2- Develop and use a model to describe why asexual reproduction results in offspring with identical genetic information and sexual reproduction results in offspring with genetic variation) do not mention DNA specifically. Students see chromosomes in action when they learn about mitosis. The standards then leap to genes and genetic expressions. This lesson has minor modifications of the lesson found on the Genetic Science Learning Center website. University of Utah. "Have Your DNA and Eat It Too!" Teach Genetics. University of Utah, 2004. Web. 10 May 2015. A materials list can be found in the resources section. Students have just completed Genetics - Tour of the Basics Web Quest. So I begin this lesson by asking some key questions to active knowledge for review. What is DNA? DNA is where instructions are stored for building and operating all living things. Where can we find DNA? DNA is found in the nucleus of our cells. When mitosis occurs where is the DNA? The DNA is wound tightly within each of the 23 pairs of chromosomes. DNA is a molecule composed of 4 types of chemical bases. They are adenine, thymine, cytosine and guanine. You will typically see each of these bases represented by the first letters: A, T, C and G. The bases form pairs with A always pairing with T and C always pairing with G. What makes us unique is the order of the base pairs. Each of us has a unique pattern of pairs. How did we discover DNA? In this short video we will take a look at the discovery, DNA Double Helix Structure, narrated by Bill Nye. I am in awe that this discovery happened in the 1950's and has been called the greatest biological discovery of the last 100 years. Take a look at your instructions for Have Your DNA and Eat it Too! We read the short paragraph at the top making sure students understand the twisted ladder shape is called a double helix. What you are building today is an edible model of the DNA molecule. As students work, I circulate throughout the room making sure they are attending to details. This lesson helps students visualize the DNA we so often reference in conversations about genetics. In this video, you will see students in action as they learn more about the mysterious DNA we often refer to but do not explain. So how do our cells use the DNA? We used analogies to help us learn about cell organelle. In DNA: The Book of You, the author uses a book as an analogy for DNA to help use understand how our cells use the DNA. Chromosomes appear in our cells during mitosis. Tightly woven in each chromosome is a strand of DNA. Your DNA will be pulled apart into two sides of the ladder. Each side will be duplicated. The new DNA will have one side of the original DNA ladder and a new copy on the other side.